Creating a professional, complete website is essential for every business. An online presence is important for any business even you have a small store. But this can be a hard job unless you know for whom you are building your website. Below are some tips for creating your successful website that will not only help you to have a stronger online presence but converting the web visitors into customers. If you’re looking to launch a website in 2018 and make it a success here we have put together 5 best tips for you. These tips will surely help you build a successful online presence. 1. Choose the right hosting service. Most people take web hosting backseat, especially newbies. Perhaps, they don’t realize that investing in the right web hosting is quite crucial for the overall success of their online business. The website hosting you choose plays an important role in the speed and loading time of your website. Remember, a fast website gives your user a positive experience and helps you gain the customer’s trust. On the contrary, a website that takes more than a couple of seconds to load may irritate the visitors and enforce them to move to a competitor website. If you are are planning to build a business website, it is advisable to go with a VPS hosting service, designed to manage traffic surge and high-database websites. The BlueHost is one well known hosting company that you can trust on. Their VPS service gives you a powerful hosting environment at an affordable price. 2. Don’t make website design mistakes. Once you have decided on web hosting, next you should pay attention to the designing part of your website. After all, great content deserves a great look, which is beyond just good color choice and pretty fonts. If you have chosen the world famous platform i.e. WordPress, you have countless theme options that can give your site a unique appealing appearance. -Look for a theme having design layout that best suits your goal. The theme with a lot of flashy animations and complex layout is not usually advisable. -Look for the browser compatibility. Remember your users are visiting your website to read your content, buy your product and services. Therefore, they should not be bombarded with the unnecessary design that may hinder their mind. 3. Practice the right SEO strategy. For most newbies, SEO is the nightmare. But believe us, you really don’t need to have any special magical powers in order to practice the SEO. Before you start practicing any search engine optimization technique, make sure you have a quality content on your website, which is one of the most important parts of SEO. Be sure to be consistent in your copywriting and use your target keywords wisely. There are plenty of tools that can help you get the best keywords for your niche along with search volume, competition, etc. Remember SEO is an ongoing process that you should start from the first day. You must create page titles and meta tags for each web page available on your site. Make sure they have your target keywords within. If you think SEO is going to be a big challenge for you, we would advise you to look for professional SEO services or see online tutorials. 4. Take help of analytics tools. As a website owner, it is important for you to know how users are finding your site, which web page they spend the most time on. This information will help you make future strategies for your website. Although there are a plenty of analytics tools available nowadays, Google Analytics is the most popular one. Maybe because it is easy to use and you can easily integrate it with your WordPress site. If you want to generate more leads out of your website, make sure your contact details are visible to your customers. Most preferably it should be at the top of the homepage. You may choose to create a separate page for contact information as well. Apart from this, your every page must have a call to action, something like ‘sign up for a service’, ‘buy a product’, etc. 5. Make use of social media. Social media can be your best weapon to enhance the visibility of your online business. Today, people of different age groups are using different social media platform such as Twitter, Facebook, Pinterest, etc. So, why don’t you take advantage of it? A well-planned social media strategy can play a significant role in the overall success of your website. 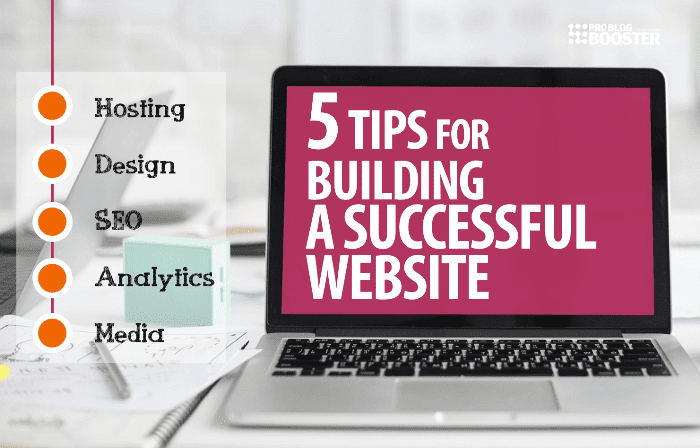 In the end, we would say if you really want to make your website success, don’t forget to include these 5 tips into your strategies. For such more posts, stay connected with us.